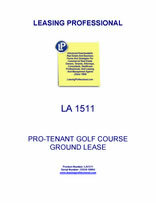 This Lease is made as of _________________, by and between COMMERCIAL PROPERTY LANDLORD, INC., a __________________ corporation ("Landlord"), and AGREEABLE GOLF COURSE TENANT, INC., a _________________ corporation ("Tenant"). SECTION 1.01. LEASED PREMISES. Subject to the terms, provisions and conditions hereinafter set forth, and in consideration of the covenants of payment and performance stipulated herein, Landlord has leased, demised and let and by these presents does hereby lease, demise and let unto Tenant, for the uses described in Section 1.04, all those certain premises described on Exhibit A attached hereto and for all purposes made a part hereof (the "Leased Premises"). TO HAVE AND TO HOLD the Leased Premises, together with any rights, easements, privileges, both subterranean and vertical, and the appurtenances and improvements thereunto attaching or in anywise belonging, unto Tenant, and the successors in interest and permitted assigns of Tenant, for and during the term hereinafter set forth. SECTION 1.02. INITIAL TERM. Unless sooner terminated under provisions hereof, the initial term of this Lease (the "Initial Term") shall be and continue in full force and effect commencing on the Effective Date and continuing thereafter for, during and until 11:59 p.m. on the date that is __________ (___) years after the Effective Date. The term of this Lease may be renewed as set forth in Section 1.04. SECTION 1.03. USE. Tenant may use the Leased Premises for any lawful purpose. SECTION 1.04. RENEWAL TERM. So long as Tenant is not in default under the terms of this Lease, Tenant shall have the option to renew this Lease for ___ (__) periods of five (5) years each (the "Option Periods") to commence at the expiration of the Initial Term. Tenant shall be deemed to have exercised its option to renew for the any applicable Option Period automatically, without act or notification being required on the part of Tenant, unless Tenant delivers written notice that it will not exercise such option to Landlord at least one hundred eighty (180) days prior to the expiration of the Initial Term, or the extended term, as the case may be. Subject to Section 2.03, the renewal of this Lease shall be upon the same terms and conditions as described in this Lease. SECTION 2.01. BASE RENT. As consideration for the use and occupancy of, and as rental for, the Leased Premises, Tenant promises and agrees to pay Landlord, while this Lease remains in force and effect during the Initial Term hereof and any extension thereto (collectively, the "Term"), and in the manner hereinafter provided, and subject to the terms, provisions, and conditions hereinafter set forth, annual lease rentals (the "Base Rent") in the sums specified below, which sums shall be paid in equal monthly installments, in advance, on the first day of each calendar month during the Term; provided, however, that if the Effective Date is other than the first day of a calendar month or if this Lease expires or terminates on other than the last day of a calendar month, then the installments of Base Rent for such month or months shall be prorated and the installment or installments so prorated shall be paid in advance. Said installments for such prorated month or months shall be calculated by multiplying the equal monthly installment by a fraction, the numerator of which shall be the number of days of the term occurring during said commencement or expiration month, as the case may be, and the denominator of which shall be the number of days in said month. "Lease Year" means a period of one (1) year, with the first (1st) Lease Year commencing on the Effective Date and expiring on the day immediately preceding the first (1st) anniversary of the Effective Date and with each subsequent Lease Year commencing upon the expiration of the prior Lease Year. (b) beginning on the first day of Lease Year six (6) and on each fifth anniversary thereafter (the last day of Lease Year six (6) and each fifth anniversary thereafter being referred to herein as a "Change Date"), the rentals shall increase by multiplying the Base Rent that is in effect on the day immediately preceding the applicable Change Date by a fraction, the numerator of which is the CPI as of the date of the increase and the denominator of which is (i) for Lease Year six (6), the CPI as of the Effective Date, and (ii) for each subsequent Change Date, the CPI as of the immediately preceding Change Date. "CPI" shall mean Consumer Price Index for All Urban Consumers (CPI-U) for the U.S. City Average for All Items, 1982-84=100, or the successor of that Index, as published by the Bureau of Labor Statistics, U.S. Department of Labor. SECTION 2.02. PAYMENT OF RENT. The rentals described in Section 2.01 and Section 2.03 shall be in addition to all other payments to be made by Tenant as herein provided and shall be paid to Landlord without notice or demand and without abatement, deduction or set-off, except as may otherwise be expressly provided in this Lease. If any of the rentals described in Section 2.01 or in Section 2.03 are not paid within five (5) days after the same are due, such past due payments shall bear interest from and after such five (5) day period until paid at the rate of ten percent (10%) per annum. SECTION 2.03 BASE RENT DURING THE OPTION PERIODS. (a) If Tenant exercises or is deemed to have exercised Tenant's right under Section 1.04 hereof to extend the term hereof for any Option Period, then the Base Rent payable by Tenant to Landlord hereunder during such Option Period shall be an amount equal to the product obtained by multiplying (x) the Fair Market Value (hereinafter defined) determined in accordance with the provisions of this Section 2.03, by (y) ten percent (10%). (c) If Landlord and Tenant are unable to agree upon the Fair Market Value on or before one hundred twenty (120) days before the first day of any Option Period, Landlord and Tenant shall each hire one (1) independent real estate appraiser, and such appraisers will engage a third independent real estate appraiser (individually, an "Appraiser", and collectively, the "Appraisers"). Each of the Appraisers shall be MAI certified and each shall be experienced in appraising commercial property in _____ County, ________. Each of the Appraisers shall, within thirty (30) days after the date of designation of the Appraisers, determine an appraisal as to the Fair Market Value, and the parties hereto agree that the Fair Market Value shall be the average of such three (3) appraisals. Landlord and Tenant shall each pay the costs of the Appraiser selected by such party and shall share equally the cost of the third Appraiser. The Appraisers shall not have the power to add to, modify or change any of the provisions of this Lease. (d) After a determination has been made of the Fair Market Value, the parties shall execute and deliver to each other an instrument setting forth the Base Rent for the Option Period as hereinabove determined. (e) If the final determination of the Fair Market Value is not made on or before the first day of any Option Period in accordance with the provisions of this Section 2.03, then, pending such final determination, the Fair Market Value shall be deemed to be an amount equal to the Base Amount. If, based upon the final determination hereunder of the Fair Market Value, the payments made by Tenant on account of the Base Rent for the period prior to the final determination of the Fair Market Value were less than the Base Rent payable for such period, then Tenant, not later than the tenth (10th) day after Landlord's demand therefor, shall pay to Landlord the amount of such deficiency. If, based upon the final determination hereunder of the Fair Market Value, the payments made by Tenant on account of the Base Rent for the period prior to the final determination of the Fair Market Value were more than the Base Rent payable for such period, then Landlord, not later than the tenth (10th) day after Tenant's demand therefor, shall pay to Tenant the amount of such surplus.